Indigenous, defined by Google is originating or occurring naturally in a particular place. What a name for a clothing brand. In our world of fast fashion, high turnover, and easy artificial textiles, originating and occurring naturally almost sounds like an oxymoron when used to describe fashion. However, INDIGENOUS is more than that. INDIGENOUS not only works with all organic natural materials, but actually hires, works with, and improves the lives of native indigenous populations in Peru. This company has been at the forefront of eco friendly clothing, and working towards a cleaner earth since 1994. They were sustainable before that was a thing. I was lucky enough to meet the Co-Founders Scott Leonard and Matt Reynolds at Coterie this year, and was instantly made to feel like family as they excitedly spoke to me about helping to change the world of fashion to a more environmentally friendly and supportive existence. To learn more about INDIGENOUS, please read their interview below. Where did the idea of starting INDIGENOUS come from? We founded INDIGENOUS to solve a problem. Fashion is the 3rd largest contributor to global pollution in the world. Hundreds of millions of people on the planet work in fashion. Over 80% are women and all too often these women are not treated with dignity or respect and exploited. 22% of all insecticides used worldwide are sprayed on cotton crops. It's estimated that 3 million people are poisoned by pesticides every year. We believed in the simple idea that when people go to work, they should not have to leave their hearts at home. We believed in that idea for ourselves, our artisans, our retail partners and everyone else who walks with us on our chosen path. For Co-founder and CEO Scott Leonard, his path began on a street corner, where a chance meeting with an Ecuadorian social activist and social entrepreneur opened his eyes to a world of possibility working with indigenous artisans. Already a successful surf shop owner who used business for social action, Scott’s heart quickly opened to the possibility of a socially responsible knitwear business. INDIGENOUS became Scott’s way to live his commitment to social good, and his path was chosen. For Co-founder and President Matt Reynolds, his path began while he was living in South America as a child with his developmental economist father working to create opportunity for those who needed it most. The special people and their culture were part of his daily life. After a prosperous early career in retail, he realized his heart was searching for more. The marriage of his retail acumen with compassion for the world’s diverse peoples and cultures was a natural personal growth step, and his path was chosen. In its early years, INDIGENOUS was a very small company built on a very big idea- to create clothing that truly honored both people and planet. That idea became a promise-a promise to use only eco-friendly materials; to pay fair wages and create opportunity for artisans in the developing world; and, to help change the way the world looks at fashion. Today, 25 years later we have stayed 100% committed to our founding social and environmental values. How long has INDIGENOUS been around? INDIGENOUS was founded in 1994. What made you decide on the name INDIGENOUS? 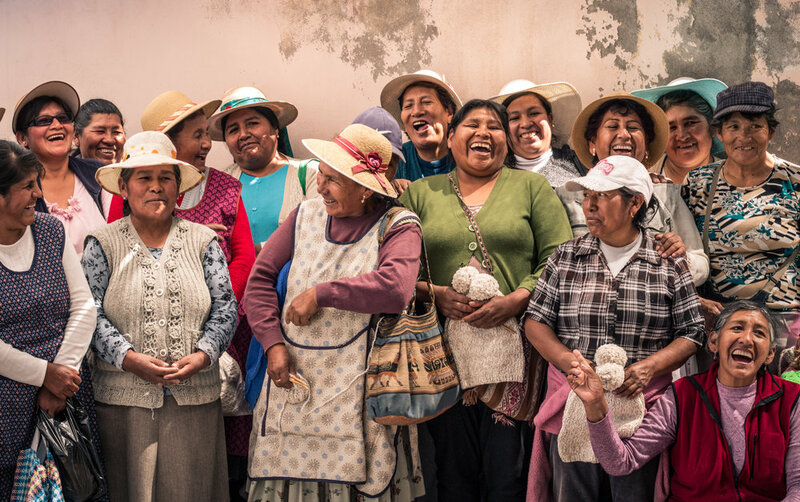 Company was founded on the vision to improve the lives of Indigenous women in the Andes and preserve cultural traditions of handicraft. INDIGENOUS are curators of exceptional product that connect humanity with indigenous knowledge. We are all Indigenous to this earth. We are all knit together. What does Organic mean to you? How is this different from the industry standard? We use the term Organic from a fiber/Fashion standpoint. Organic Fashion is fashion made with the use of certified organic materials, such as organic certified cotton. Certified organic cotton is grown without any harmful pesticides, herbicides, insecticides or artificial fertilizers. According to the Organic Trade Association (OTA), conventional cotton uses approximately 25% of the world's insecticides and more than 10% of the pesticides. Most of our organic cotton is produced in northern Peru near Trujillo and Amazonas, but some is also produced in the south. Our primary organic certification is provided GOTS ( Global Organic Textile Standards ), a third party that survey and certifies organic fiber and production standards. Organic cotton clothing is popular for a reason. The soft texture and breathable nature make it a very wearable fiber. In addition, the arrangement of the cellulose gives cotton a good degree of strength, durability and absorbency. Indigenous does not use conventional cotton. The company uses organic cotton in our lighter knits and wovens and with other natural fibers to add strength and soft texture to our blends. 22% of all insecticides used worldwide are sprayed on cotton crops. It takes 1/3 lb of pesticides to make one shirt. It's estimated that 3 million people are poisoned by pesticides every year. China's textile industry processed 41.3 million tons of fiber and accounted for about 55% of the world's total production. A single mill in China can use 200 tons of water for each ton of fabric it dyes. Aldicarb, an insecticide used for conventional cotton is so acutely poisonous that one drop, if accidentally absorbed by the skin, is enough to kill and adult. Thankfully, Aldicarb has been recently banned in some parts of the world. What does Fair Trade mean to you? How is this different from the industry standard? What got INDIGENOUS started on the path of slow fashion? Was anyone else doing it at the time? From the beginning in 1994, INDIGENOUS has used only the finest natural and organic fibers in our clothing. We wanted to keep harmful chemical toxins found in synthetic and non-organic clothing out of our eco-system and away from your body. In addition, the INDIGENOUS was founded on a model of ethical sourcing, ensuring that artisans in our supply chain receive fair wages and enjoy a safe working environment. We accomplished this through a close collaboration with our production partners, artisan workshop leaders and others. Our mission has always been to elevate artisans in the poorest regions of South America to world renowned status in the handicraft textile market while preserving the rich cultural heritage. When we started 25 years ago, we were not the only apparel brand working hard to clean up the dirty fast fashion industry by forging a path toward ethics & sustainability. For example, we have collaborated with Patagonia along the journey and had the opportunity to meet Yvon Chouinard, which was inspiring. Patagonia was simultaneously launching their commitment to using only 100% certified organic cotton. There were other ethical and environmental fashion brands launching during the late 90’s, such as Under the Canopy, EcoDragon, Mission Playground, Stewart & Brown, etc. Unfortunately, most of these brands were not able to survive. The exciting news today, is that ethical fashion has begun to hit mainstream. I believe ethical fashion has the potential to be the fastest emerging market in the 2 trillion-dollar apparel market! Bottom line - “Slow Fashion” feels better to wear, is made fair with integrity, and lasts longer. What countries and communities do you work with? What inspired you to work with these people? We predominantly work in Peru and other regions throughout South America. From my childhood, I have always recognized that we come from a very diverse planet and that my true worth would be derived from giving back rather than taking. The artisan is one of our most valued partnerships. This is not charity, but rather paying a fair wage for their masterful work while providing the necessary assistance to help make the artisan more successful in the international market place. Scott and I have always had an incredible respect and appreciation for indigenous culture and textile mastery. But our end goal is to reach out globally to other indigenous artisans. Eventually, we will have the opportunity to mirror our fair trade cottage industry production model and expand into other parts of the world to help create opportunity for indigenous artisan communities globally. How are you working to help reduce and eradicate poverty in these communities? Since inception, Empowering Women & Communities has been in our DNA. INDIGENOUS works to reduce and eradicate extreme poverty in artisan communities by providing economic opportunities to marginalized women workers. Instead of providing communities with unsolicited help, INDIGENOUS works together with its employees to create lasting economic opportunities. INDIGENOUS believes that true economic change comes from empowering artisan communities with the right tools. The eradication of extreme poverty requires a combination of strategies, ranging from access to jobs, financial resources, the ability to own land and other assets, along with access to basic services including natural resources like clean, potable water. INDIGENOUS works to mobilize resources while giving communities entry to global markets. In addition to broader market access, employees are offered free skills training to increase their employability and expertise. This training enables women to obtain higher-paying and more reliable workloads that lead to higher incomes, more flexible schedules, and year-round work. This, in turn, leads to economic independence: heading their own households, starting their own artisan workshops, and lifting their families and communities out of poverty. Why do you focus on hiring female workers in artisan communities? Up to three-quarters of garment workers worldwide are female, yet these women receive little of the profit generated from the massive and powerful textile industry which grosses over 439 billion per year. INDIGENOUS understands the fashion industry's power and influence on the lives of women producers and takes steps to reduce inequalities by investing in its skilled female workforce. Many women in the INDIGENOUS supply chain are able to work from home, even setting up home-based workshops and hiring other women from their local community. Suddenly, handcrafting at home becomes legitimized and respected for the technically-demanding work that it is. At INDIGENOUS, women are valued, cared for, and empowered. Yet gender equality is about more than just the way in which women workers are treated; it is gained through increased access to resources that enable women to grow their businesses and achieve financial independence. INDIGENOUS offers zero-interest loans to women who might otherwise be exempt from capital access. With these no-cost loans, artisan producers can scale their businesses and expand their market base, providing themselves and their families with economic stability. Can you please tell us about your domestic violence programs? In addition to empowering women economically, INDIGENOUS has taken an active stand against domestic violence with programs embedded within the supply chain that focus on domestic violence education. 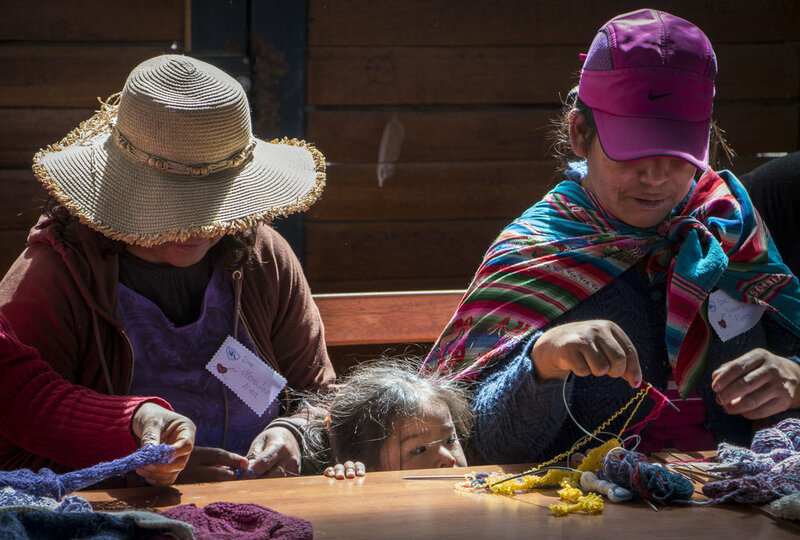 Another effective program gives women artisans in Arequipa access to temporary shelters and services for victims of domestic abuse and their families. All the artisans in the supply chain also have financial literacy programs that help them gain and maintain economic independence. How do you make sure you are taking good care of your workers? How is this different from other companies? We ensure workers are being taken good care of by conducting both third party fair trade audits with organizations such as WFTO (World Fair Trade Organization) and FTBP (Fair Trade Business Practice), as well as regular on-site visits from the Indigenous Designs Production team. We are proud of our unique application, The Fair Trace Tool, which we have used to engage supply chain transparency to the INDIGENOUS customer. The Fair Trace Tool engages our end customers in the lives of our artisans and shares the social impact of an INDIGENOUS purchase by simply snapping a QR code on our hang tags. The back end of the Trace Tool allows us to communicate directly with our artisan producers at the BOP (Base of the Pyramid) via cell phone based voice and text technology. Our interactive artisan survey system is anonymous and confidential so that our artisans feel safe and not “watched over”; and uses the Grameen Progress Out of Poverty index and our own questions to gather information. These are simple questions such as: “Do you have a safe and participatory working environment,” “Are you better off than you were 6 months ago,” and economic indicator questions such as “Does your household contain a refrigerator?” which tell us a lot more than that they simply own a refrigerator. It tells us a).They have electricity, b). They are meal planning, and c). they can purchase a big-ticket item. The information we collect is used to determine the economic and social well-being of artisans in our supply chain, which we then share transparently with our end customer. We work in some of the poorest regions of South America, and it has been a long journey to get to this point, but thanks to the concerted effort throughout our supply chain, we are making huge strides. What would you be your ideal rules and regulations for the fashion industry? Textile Exchange: A Texas-based organization formed in 2002 to boost organic cotton supply that now also leads standard development for other fibers like down and wool and plays a hub role with its annual international Textile Sustainability Conference. Fibershed: A California producer-led nonprofit working to develop regional and regenerative value chains that operationalize community driven soilto-soil textile systems, with a focus on soil carbon restoration on working lands. The organization also works with over 50 self-organized Fibershed affiliate projects in 6 countries. Responsible Sourcing Network (a project of As You Sow): A certification initiative focused on the spinner stage of the supply chain, with a current goal of tracing cotton picked with forced labor in Uzbekistan and a longer-term plan to launch a branded cotton yarn product from certified mills. Sustainable Apparel Coalition (SAC): A relatively new organization that has gained traction with its Higg Index, a suite of self-assessment tools for measuring environmental and social sustainability throughout the supply chain. The Higg index is now used by over 150 companies, representing a conservative 40% of the apparel and footwear market. Cradle to Cradle Products Innovation Institute (C2C) and Fashion Positive: A “closed-loop” advocacy organization that bridges the gap between industryfacing and consumer-facing efforts. Its Fashion Positive program works with textile and apparel companies to identify C2C-approved suppliers and is currently working to develop a “library” of C2C approved materials for designers. C2C also leads the Circular Innovation Working Group and runs an emerging consumer-facing social media campaign. Common Objective (CO): An organization that aims to place equal emphasis on social and environmental impact, alongside financial goals for the fashion industry. Canopy Style, a small but powerful non-profit focusing on the environmental impacts of textile fibers that are derived from wood, especially rayon, viscose, modal, and lyocell. Fashion Revolution: A fast-growing global campaign that marks the anniversary of the Rana Plaza factory disaster, April 24, 2013, with a social media campaign demanding transparency from brands with the hashtag #whomademyclothes? Remake: An emerging California-based nonprofit focused on telling the stories of the people in the global textile and garment industry as a tool to build empathy and a conscious consumer movement. Unlike other advocacy campaigns, Remake also works within brands to build employee and management commitment to sustainable approaches. WFTO and Fair Trade USA – fair trade certification organizations. Simply put, it would be incredible if the fashion industry at large embraced the United Nations Sustainable Development Goals (SDGs). The SDGs provide a clear path forward for a sustainable, just and prosperous future for all. Can you please tell us about how you are bringing clean water and sanitation to your workers? We have a goal to provide 250 highland artisans and their families with clean, potable water. INDIGENOUS keeps its supply chain free of all hazardous chemicals, ensuring that all the water that enters the production value chain can safely reenter the surrounding ecosystem. INDIGENOUS works both with and within vulnerable communities to restore water-related ecosystems, understanding that proper highland water management affects forests, wetlands, rivers, and the ability of aquifers and lakes to regenerate over time. INDIGENOUS works with farmers and ranchers to reduce the water used for agricultural purposes, leading to 48,450,000 L of water saved annually. INDIGENOUS also understands the need and importance of clean sanitation education for its artisans, paying particular attention to the needs of women and girls. Together with our partners in Southern Peru, INDIGENOUS established a community water distribution system, ensuring that the artisan groups and the community-at-large have a source of clean and reliable water. The purified water from a well system at our QC center is distributed regularly to artisan workshops in the arid Andean highlands/foothills around Arequipa. INDIGENOUS takes both a preventative and active stance for clean water, both preventing contamination and rebuilding water service systems. How are you working to help fight climate change and help the environment? Taking steps towards climate action requires an integrated approach between reducing negative impacts and investing in regenerative practices. For example, INDIGENOUS obtains much of its material from free-range animals, especially alpaca. The relationship between grasslands and grazing animals dates back well before humans began to raise and domesticate them. Healthy grasslands are essential assets in the fight against climate change because they sequester and store large amounts of carbon. When alpacas are left to roam and interact naturally with their native grasslands, they restore soil fertility leading to carbon drawdown. Through our innovative production methods, INDIGENOUS is also able to keep 20,750 KG of carbon dioxide out of the atmosphere each year. Together with our partner organizations we have helped fund the construction of several reservoirs throughout southern Peru. These reservoirs significantly mitigate the damage to alpaca herds from periods of drought brought on by climate change. These reservoirs not only provide a water supply for the animals but also act as an irrigation source for native grasslands. Eco-friendly farming methods used in growing INDIGENOUS' certified organic cotton also significantly reduce the CO2 footprint associated with clothing production. Organic agriculture also reduces the amount of unfixed fertilizers that find their way to waterways through irrigation and rainfall, pollution that typically leads to algal bloom and other destructive issues. Another benefit to the natural materials found in INDIGENOUS’ apparel is that they are intentionally absent of synthetic fibers. Synthetic fibers such as polyester can shed small particles leading to microplastic pollution, having a detrimental effect on ocean life and the aquatic food chain. You are a bit of a pioneer for sustainable fashion, are you excited to see that it is starting to become more popular? The powerful combination of consumer demand and retailer interest creates an exceptional, right-timed opportunity for our INDIGENOUS omni channel growth. We are so happy when we hear about consumers taking the time to stop and think about how their purchase is affecting those that made the product and how the product affects the planet! Where would you like to see the fashion industry in the next 10 years? As we approach the last year of a decade, I think it is fair to say we will see the end of things as we know it. The problems in the fashion industry are becoming more & more transparent to the end consumer. The seeds of fair trade & organic when it comes to fashion are beginning to take root. We enter stores and are faced with more choices than ever before. Our every desire is only one click away. As a society, we are getting used to getting what we want, at the exact moment we want it. In the future, most people will expect to track a products lifecycle as easily as they track postal packages today. This will help rise the tide for demand of genuinely certified fair trade & organic fashion. It is becoming clearer than ever that there isn't a tradeoff between beauty and ethics; soon we won't distinguish between Ethical Fashion and fashion, it will just be Fashion. In 10 years time, brands that don’t commit to being eco-friendly and ethically-sourced are going to be seen as “old fashioned” and regressive. ‘Business as usual’, will no longer be acceptable. How can fashion be a force for good? Hundreds of millions of people work in some aspect of the fashion industry. Currently, the industry is rife with social injustice and toxic output. There is another way. Indigenous is a bellwether example of a fashion brand turning a dirty industry upside down. If the fashion industry were to adopt just half of the 17 Sustainable Development Goals into their operating infrastructure, we would see a massive social & environmental economic benefit for the World. Hundreds of millions of lives would be lifted from poverty while eradicating toxic chemicals from our eco-system. For 2019, INDIGENOUS is taking our culture of caring beyond our supply chain and bringing it directly to our customers. Through our newly revamped website—INDIGENOUS.com—shoppers can find out what's behind our label; shop story-driven collections; meet the artisans who make our clothes and learn about our intensive commitment to organic and sustainable practices. This site relaunch coincided with the Earth Day opening of our first-ever retail store, located in Petaluma, CA, near our corporate HQ in 2018. At our new store, we can directly engage our local community and bring our farm-to-fitting-room philosophy full circle. INDIGENOUS was also featured in our Fall’n for Green Editorial.